The following acts as my introduction to the students’ notes on the Energy chapter. Nobody knows what energy actually is and by pretending otherwise we actually do you the student a disservice. Not only are we ignoring the wonder associated with the idea, we are also denying you the opportunity to engage with the concept at any level beyond the superficial. Bottom line; nobody gets energy because there’s nothing to get. Energy is not tangible (it is ‘an indirectly observed quantity’); you can’t hold it in your hand, you can’t weigh it on an electronic balance, you can’t see it, touch it, smell it etc. Yet when the universe was first created there was a certain amount of this put in to the mix (actually now that I think about it the mix itself was energy (with perhaps just a little dash of time)), and it’s all still there today. Its form can change, but the energy itself can’t ever disappear – no sirree bob. Well it’s a means of payment for goods and services, right? Somebody sells you an orange and you agree to transfer into their account a set amount of this ‘money’. And now that the shopkeeper has this money in his account he can use it to buy something else. So in effect money is just a transferrable IOU. Now energy is a bit like this, but there is only a certain amount of IOU’s in the universe and this was set when the universe first came into being. To complicate matters further, since the early part of the last century we now know (thank you Albert) that all matter (‘stuff’) is basically energy in another form. All right, let’s listen to Richard Feynman give his take on it. There is a fact, or if you wish, a law governing all natural phenomena that are known to date. There is no known exception to this law – it is exact so far as we know. 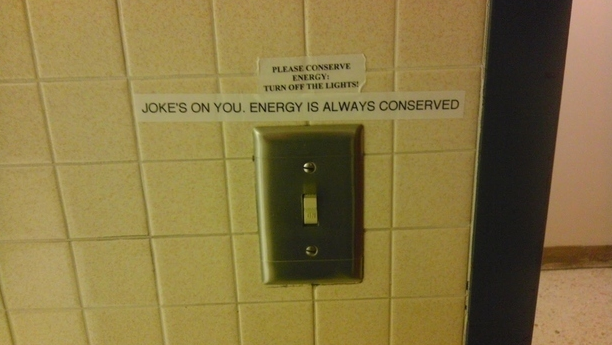 The law is called the conservation of energy. It states that there is a certain quantity, which we call “energy,” that does not change in the manifold changes that nature undergoes. That is a most abstract idea, because it is a mathematical principle; it says there is a numerical quantity which does not change when something happens . . . it is a strange fact that when we calculate some number and when we finish watching nature go through her tricks and calculate the number again, it is the same. It is important to realize that in physics today, we have no knowledge of what energy “is.” We do not have a picture that energy comes in little blobs of a definite amount. It is not that way. It . . . does not tell us the mechanism or the reason for the various formulas. “It is important to realize that in physics today, we have no knowledge of what energy is,” he was recognizing that although we have expressions for various forms of energy (kinetic, heat, electrical, light, sound etc) we seem to have no idea of what the all-encompassing notion of “energy” is. Now with that interesting bit out of the way, let’s go see what we need to know for the exam. I am not happy with the Leaving Cert Physics exam. In a nutshell – it’s too hard. The vast majority of the questions come from material teachers cover in sixth year, and the closer you get to the end of the course, the more popular the exam questions. Nothing wrong with this so far, except when you consider that this often represents the most difficult sections of the course. And never forget that Physics is a difficult subject to come to terms with at the best of times. So many concepts are very, very counter-intuitive. After all, only one civilisation ever accepted it as a means of generating knowledge about the world around us. Even if you look at some of the material that we do cover in fifth year, the questions on this in recent years have been very, very difficult. Optics is usually the first thing we cover and yet, based on the questions on this topic that appeared in 2011 12 (b) and 2012 12 (b), I now have A students who swear they won’t go near the topic if they see it on the paper this June. Which is why the following document seems is very popular with students (particularly those struggling a little with the subject). It looks at the pattern of questions that have appeared since the syllabus first came into existence in 2002 and allows you to decide what questions to focus on. For example Static Electricity and Capacitance are two short chapters, and they have appeared every year since 2002 as a half question, with the exception of last year, so expect them to make an appearance this year. Electromagnetic Induction came up every year from 2002 to 2008 as either a full or a half-question. It hasn’t appeared since 2008 however. Expect it to appear as either a half or a full question. The Electron has appeared on 9 of the last 11 years. Nuclear Physics (that’s Radioactivity and the atom, along with Fission, Fusion and Nuclear Energy) has appeared every year as either a half or a full question. You can see similar patterns for other topics listed in the document. The important point is that, assuming you’re going to do Question 5 (series of short questions which cover the entire course, with choice built in) and Question 10 (Particle Physics; comes up every year) then you really just need 3 questions from the remaining 6 (and one of these is Question 12, which offers a choice of 2 parts from 4). Every year since 2002 you would have been able to answer a full paper by just learning the topics below (and usually with some choice to spare). You still need to cover all Mandatory Experiments for Section A, and all definitions for Question 5, but if you’re a D or C student it would be highly advisable to use this as your guide. If you’re looking for the A then you really need to cover all topics on the course to cover yourself for all eventualities. UCD School of Physics is delighted to accept applications for our 2nd International Particle Physics Masterclass (IPPM), aimed at 5th & 6th year Leaving Certificate Secondary Students. This is your chance to get your hands on real LHC data and analyse it to find W & Z bosons, and look for evidence of the Higgs! UCD School of Physics as part of a worldwide initiative is inviting students from around Ireland to participate in a one day Masterclass to delve deeper into the mysteries of particle physics. Last year’s IPPM event was a great success with students from 35 schools nationwide coming to UCD Physics for a day of hands-on-learning about particle physics. This year again we invite you to apply for a place on the UCD School of Physics International Particle Physics Masterclass 2013. UCD School of Physics, will provide students with state-of-the-art computing facilities, specialised software, expert guidance and real data direct from the CMS experiment at CERN in order to allow you to look for W & Z bosons produced in the collision of two protons at the LHC. Click on the following link for the UCD IPPM Application form in .doc (MS Word) format. If you or members of your physics class at school would like to participate at the UCD School of Physics Particle Physics Masterclass, please ask your teacher to send an email to the appropriate address (email address is available in the MS Word document) with the subject line ‘PARTICLE PHYSICS MASTERCLASS’ (or fax 01-2837275). The closing date for receipt of applications is Wednesday, the 6th March, 2013. Successful applicants will be contacted in early March. What happens when, if travelling forward at 100 km/hr, you throw something backwards at 100 km/hr? It may be tricky to demonstrate in class, so here are a couple of useful resources. From a Japanese TV show – a real life example of adding vectors and relative motion. Scroll forward to the 3 min mark if this doesn’t happen automatically. Isn’t Physics just mad Ted? Now for something completely different (well there are some references to direction in there, so it just about qualifies). An appreciation . . .
Every now and again I get a letter like the following, which makes all the time and effort put in over the years worthwhile. The letter has been edited slightly to protect the innocent. (I also just received my first donation on the website – thanks Lisa – so I’m now up to a grand total of €50. Actually my sister also donated €1 over a year ago, just to confirm that the link was actually working, but I’ve been meaning to give that back). My name is ______________. I am a student who undertook Physics for Leaving Cert 2 years ago. My physics teacher . . . I was under the impression that Physics would be an easy subject . . . and that it required no work. How very wrong I was. When I saw notes over the summer of 5th year belonging to my friends in other schools I saw how much work I had to do. Luckily I stumbled across your website and from then on things looked brighter. I suggested the site to my class mates and we immediately started to ‘get the hang’ of Physics. I scored an A2 in Physics and surpassed my expectations. Of a class of 18 there were 3 A grade, 12 B grades 2 C grades and an A at ordinary level, all thanks to you and your marvelous notes. I’ve gone on to study Biomedical Science. I still use the basic fundamentals of physics everyday, and I learned these fundamentals from you. 4 from the class went on to study Physics in the class, 6 went on to do Engineering, and 2 are studying music. The rest are in Mathematical Sciences and Veterinary. On behalf of our class, I just wanted to thank you. We may never meet you in person, but you have made a huge impact on the direction of our education, simply by making what we were learning interesting. I cannot thank you enough for this.